- Premium Quality, Polished One-of-a-Kind Natural Brazilian Agate Slices. Great Gift! - Random Pattern Colors Vary. 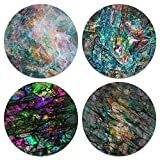 - Teal Brown Brilliant Brazilian Agate Coaster. - Hand Chosen for Quality, Pattern, Symmetry and Color Definition, Polished Both Sides. 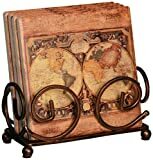 - Makes a Great Display Piece Unique Decorative Item for Entertaining. 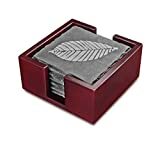 Thirstystone Occasions Square Coasters are 4.25" of design and protection. The absorbent stoneware, coordinating holder and guard to any of your surfaces. 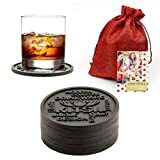 - MODERN DECOR RUBBER COASTERS! Intricate honeycomb pattern with Fleur-de-Lis symbol at the center provides a sophisticated and modern look. Artaste specializes in the production of quality products for the culinary enthusiast in your home. 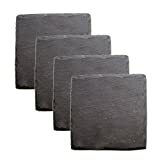 - Hand select quality Set of 5 with FREE Rubber Bumpers to protect your furniture. - New Released Golden Coated Edge Coaster 3－4". Blue, Teal, Natural, Pink, Purple. - Each set is unique due to the material and you will receive one similar to the pictures shown.